The class 8C 2-6-2t type dated from 1916. 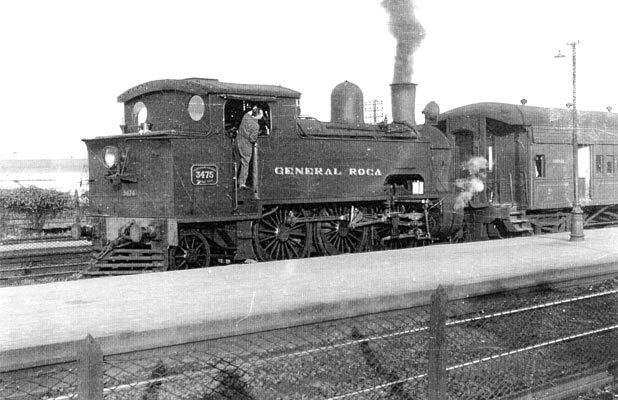 They were 2 cylinder machines used on the suburban services of the 5'6" gauge Ferrocarril General Roca (FCGR) operating from Plaza de la Constitución. The first locomotive to be modified, No.3485, was dealt with in 1952. Porta described the work undertaken as light modifications. He dealt with the exhaust ejector, combustion system improvements (these machines being oil fired) and valvegear alterations. These machines received what Porta described as a 'Lemâitre' type exhaust system. In other words they received an early incarnation of what has become known as the Lempor exhaust ejector. A problem noted was the carbonisation of the blast nozzles which had to be removed if performance was to be maintained. This problem was to be solved with further development of the Lempor system, principally on FCGB No.1802. At the same time 2-6-4t Class 8E locomotives were receiving a similar set of modifications. The modified 8Cs were able to outperform the unmodified 8Es. Considering the later machines were 3 cylinder locomotives with nominally greater superheat (last batch only) this was quite a statement on the effect of Porta's work. 900dbhp is the quoted maximum output, which was the peak output for the unmodified 8Es. In all 11 8Cs were so modified. Following the success of the light modification programme 8C No.3477 was given a much heavier rebuilding in an attempt to improve all-round performance and the removal of the many weak points of the design. Click here to read about this locomotive. Further details on the locomotives modified at this time can be found in Porta's 1969 I.Loco.E. paper, now available in book form. Published by Camden Miniature Steam Services details are here.